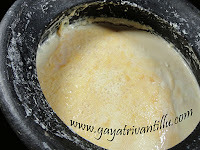 Take a mixing bowl and add hung curd and smooth mango pulp and mix well with a ladle. Once mixed well taste the mixture and then add sufficient powdered sugar. Mix the mixture well till sugar is dissolved in the mixture. 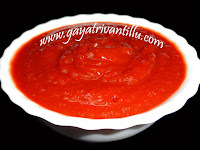 Amrakhand is ready---but for smoother texture---pass the prepared amrakhand through a sieve. Transfer the prepared amrakhand into a bowl and chill. Serve chilled garnished with chironji or small mango cubes or chopped blanched pistachios. Take thick hung curd for making the amrakhand as adding mango pulp dilutes the texture.Take pulpy mangoes for making this dessert rather than the runny juicy mangoes. Pulpy mangoes give thicker pulp and we get nice and thick amrakhand. As an option mix powder of one cardamom to the prepared amrakhand---however---personally I do not like to change the flavor of mango in the amrakhand and hence I have not added cardamom powder. While serving, garnish with a contrast color nuts to the bright yellow amrakhand to enhance the look and taste. Traditionally shrikhand is garnished with chironji and hence I have added them in amrakhand too.